In a couple of weekends I will holding a flytying “hangout and tie” with the awesome guys at Troutfitters. Thats Montana Troutfitters in Bozeman. It’s funny because I really don’t know what to tie…my patterns are getting simpler and simpler… but I do love tying. After my trip for steelhead I got very inspired and tied for several days non stop… recently I’ve only being tying what I’ve needed for the next trip… fresh bugs so to speak. The most recent trip was with JB - fishing below the dam. A heap of nice fish on a fire orange bead sow bug and the midge. I recently had the absolute pleasure of meeting Mr Nelson Ishyama at the Golden gate Angling and casting club. With many prominent flyfishing folks and world champions - I was privileged to be given a quick tour of the premises. “The GGACC was organized in June 1933 as an offshoot of the San Francisco Fly Casting Club. The San Francisco Fly Casting Club, the second oldest casting club in the U.S., was founded in 1894, when the first tournament was held as Stow Lake, Golden Gate Park, San Francisco. The world's single-handed fly casting record of 133 ft. was established by club president Walter Mansfield in 1899, and held for 35 years to 1934. He also cast a 5 oz. fly rod 129 1/2 feet at a 1902 tournament. What a cool way to spend an hour or two in San Fransisco! Afterwards my wife and I ate at “Ebisu” . WOW! highly recommended for amazing Japanese cuisine! Thank you Nelson for your hospitality and welcome! The first day of the year was pretty cold… single digit temperatures (f) and about -13 celcius was the coldest I’ve ever experienced. The lake was frozen over but water was spilling over the dam. Water temps below dams are often warmer than true freestone streams. Drew and I had a few fish come to a hot orange sow bug nymph and then with rising fish around me - I just had to tie on the trusty Griffiths knat and get amongst them. I thought they were going to be easy but the fish and ice kept me on my toes. Several small browns to the hand were welcome before the temperature saw us heading for the truck heater and hot coffee! Some quick pics from NZ - also appearing on my Instagram account. i figure it might be time to put a few more pics online! 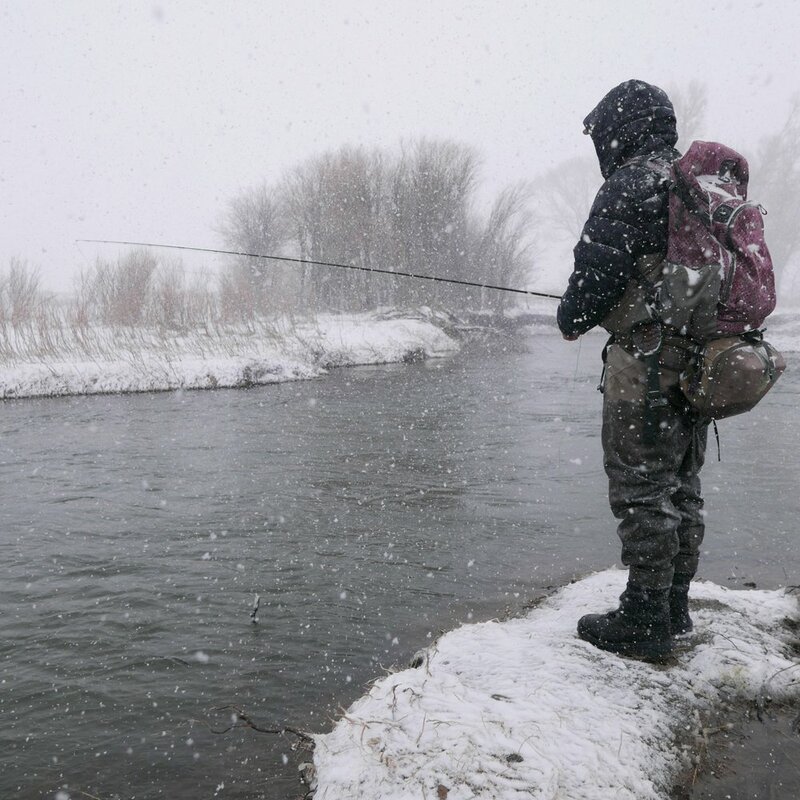 New Years day was blinding cold in BZN, MT but Drew and I still got out for a fish… I even managed a few on the dry. A wee griffiths knat. At this time of the year be prepared for seriously cold temperatures but any overcast day above 0c or 36f and youre in business. Fishing a midge and either something to get down or with color and split shot if prospecting will work - and then when the fish start rising… use your favorite midge pattern. Seek out water which is deeper and slower than you’d expect during the regular season and wade carefully. A fall into the water at this time of year can be fatal. I’m already looking forward to the season starting in March and getting my license as a MT resident. That’ll be a serious treat! Tried out the new Simms gloves.. brilliant. Watch this space and I’ll try to get photos. The pro dry glove + is bomber!! Before that - I’m heading off to chase Bonefish. Busy tying flies and checking out new flat boots…. Since moving to the US I have been waiting for Immigration. This has allowed wonderful opportunities to fish and enjoy Montana. However, with newly minted work papers - I am “chomping at the bit” to get my teeth into some projects. Yellowdog flyfishing adventures - Jim and his team, have been waiting patiently for me to join them and in the coming year I look forward to joining him to launch an Australian program and support the NZ. 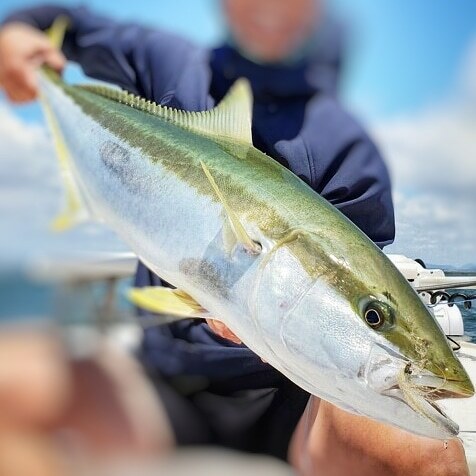 I’ve been able to join Tourism Australia to work out several signature programs and can’t wait to get back downunder to check them out and share them with anglers from around the world. It’ll be good to support the NZ program too and my recent visit to see family allowed me to connect with partners. It always helps too when I get to fish!! More on that later. It’s getting cold here in MT but the NZ season is just warming up. …. Thanks to a very kind friend I have recently spent time in Alaska chasing Steelhead (or Sea run rainbows). Oh what fun!! I had been here 11 years earlier with the John and this was a wonderful return. The river is small and the run is of a very good size. This year the fish were anything from 20-30+ inches and bright silver from the ocean. I landed several still with sea lice on them!! Initially I used beads and nymphs to coax these fish to bite but over the week progressed to using almost exclusively streamers to swing for these freshies! I believe I found the bigger bucks were more likely to strike the streamers and they were incredibly strong in the tidal water. I used black egg sucking leeches and then met Paul from “Fins and Fire” flyshop in Oregon - who introduced me to small Dalai Lamas and a couple of custom patterns of his own. Instilled with great advice and new flies I managed to convince fish to bite - and even though I only landed about 50% of those I hooked - What a great time!!!! I returned to MT fully addicted to steel… So many more new things to learn from flytying to the swing and double handed casting. Flyfishing is certainly a never ending journey! Well its certainly feels like autumn here in Montana. Cooler days and just the start of the color turn. Up until now - the fly of choice for me has been the "chubby..."
Since the Salmon fly hatch in June I don't believe I've fished too many other flies. It's been the go to for most of the guides I know and it is the best general terrestrial pattern I've used this summer. (maybe because it's all I've tied on!!??) In colors ranging from pink to black - those two have been my favorite. A callebaetis glister and tan have been solid - but invariably I've really only used two main patterns. I'm starting to go smaller in size as the days get cooler and it's a nice change to be throwing 14s as opposed to the 8s and 10s of last month. A great buddy has just been here from NZ and we managed Goldens, two types of Cut throat, Browns Rainbows and Whitefish in the three days of fishing. All on dries and with 4 weights. Oh what fun. Well it's hopper time in Montana. I've had some awesome fishing on all of the local streams I frequent and was treated to a great piece of water within the city boundaries last week - which was a real privilege. It's funny but I hear the word technical used here a bit when referring to slow slough type water or spring creeks. Used to long leaders and presenting to spooky fish I wonder if a reach cast would solve many issues when faced with challenging water... Here's a piece I wrote and posted elsewhere ... a google search will provide some good videos to reinforce the method. Enjoy... The reach cast. This might be one of the most important casts to learn as you advance your flyfishing. This is a aerial slack line cast that will help with your presentation, paricularly when presenting a fly across and or downstream to a fish. When nymph fishing it will give your fly more time to sink and provide the first mend even before your fly has hit the water to slow down drag. When casting dries to fish in the tailout of the pool or trying to beat pocket water currents, this is a great cast to present your fly in a drag free manner downstream. Another advantage is that the fly is the first thing a selective feeder will see rather than leader or tippet. Critical in many situations on the Missouri or our local spring creeks. Cast and literally reach your arm outwards and to the left or right as required. Smaller movements for less of an angle. Reach after you have stopped the forward motion of the cast so that your fly still lands where directed. Once your fly has landed, lift your rod tip to pick up the slack and follow your fly with your rod tip to extend your drift. A great cast to learn and essential for creating those drag free drift opportunities! Apologies for such delay in writing! It has been a few weeks since my last entry and I have since travelled a number of new waterways. Hopper season is really starting to take off fishing is right at its peak here in Montana! 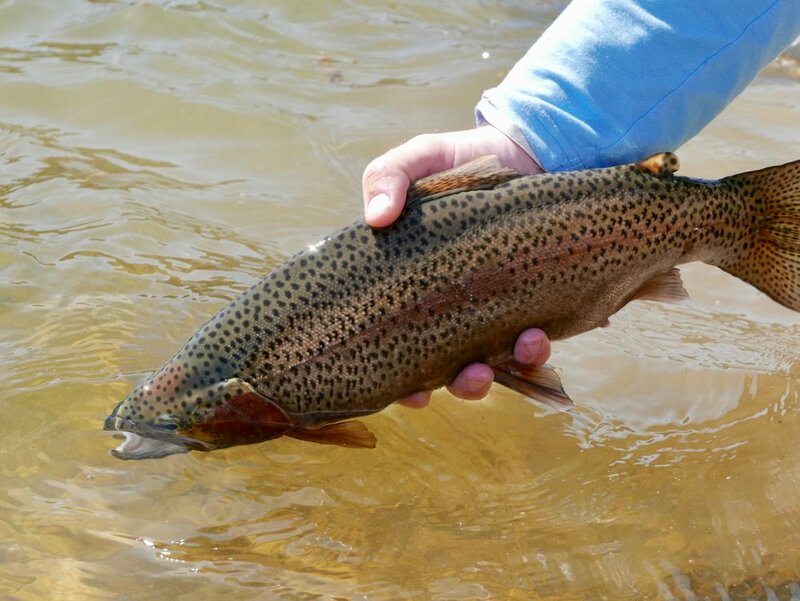 Back in NZ – I see the rainbows are running and friends are enjoying the “grab” as they swing flies on the Tongariro or chase XOS fish in the Twizel canals. My goal is to write more consistently and also post pictures of the new flies I am tying since moving Stateside. In particular I have had some inspiration and help from one of the best young anglers I have ever met – Jake Walbridge . 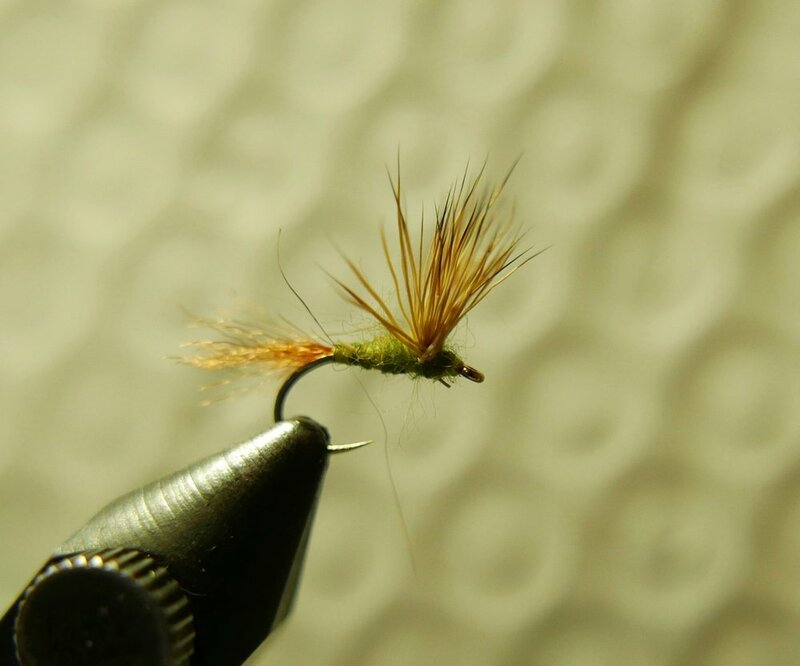 His caddis fly is incredibly effective, simple to tie and robust. Perfect! Right now it is wonderful to be able to fish exclusively dries. My usual set up for the Gallatin presently is a Chubby with a small caddis behind. This rig is bringing me endless action and it’s pretty hard to chop and change from a proven combination. I’ll be tying my own chubbies after today. That’ll be interesting and a challenge but I will post photos and you can be the judge. Of course ultimately it is the fish that decide… but as I din’t give them all the credit I look forward to any feedback. Growing up in NZ - we would hang out in the library ...waiting for "Flyfisherman" magazine and the exotic fly ties and tales of amazing destinations. Little did we realise that NZ itself was a bucket list destination for many anglers.... We just lived in paradise and it was our normal! I always read the articles by Mike Lawson and Rene Harrop and I had watched all the old VHS tapes featuring Gary Borger. He was fishing the "Ranch" on the Henry's Fork- Homewater for Mike Lawson and Rene Harrop. Over the past weekend I finally made it to the Henry's Fork Harriman Ranch section. It didn't disappoint. Hallowed water and the gentle dimples of trout feeding on PMDs. Trout hunting is what NZ fishing has to offer. Finding single fish and feeding them your fly. The HF ranch section is exactly that too. Find your rising fish, stalk into range and give your best presentation. Patience, a careful approach, light tippets and downstream presentations are essential. The fish are wary and anglers from all around the world come into this corner of Idaho to pit their skills. Opening day was the 15th of June and it was a very cold and wet day. Saturday wasn't much better but as the day progressed so did the temperature and the rain soon dissipated. The PMDs came off beautifully in the morning and fish were up. As the wind got up - the hatch petered off but we found fish would take a big green drake if they were looking up. It was a new style of fishing to me. Only waiting to find rising fish and sometimes staking out a wee corner to establish a rhythm riser or nice 'bow working an area. It was funny to hear locals talking about a couple of young guys who were stripping leeches - to great success - and their thoughts on pedigree. I'm sure nymphs worked quietly would have been deadly... but when in you've made the pilgrimage.. it's not about the fish..
We found some tricky bank feeders and I received my first lesson from the local piscatorial natives. My friend JY got a few beauties and I joined him on the walk downstream towards the "bonefish flats". Like all famous rivers the pools are named and stories are deep. After getting my training stripes on a few willing wee rainbows I finally found a good fish sipping in some windy water. 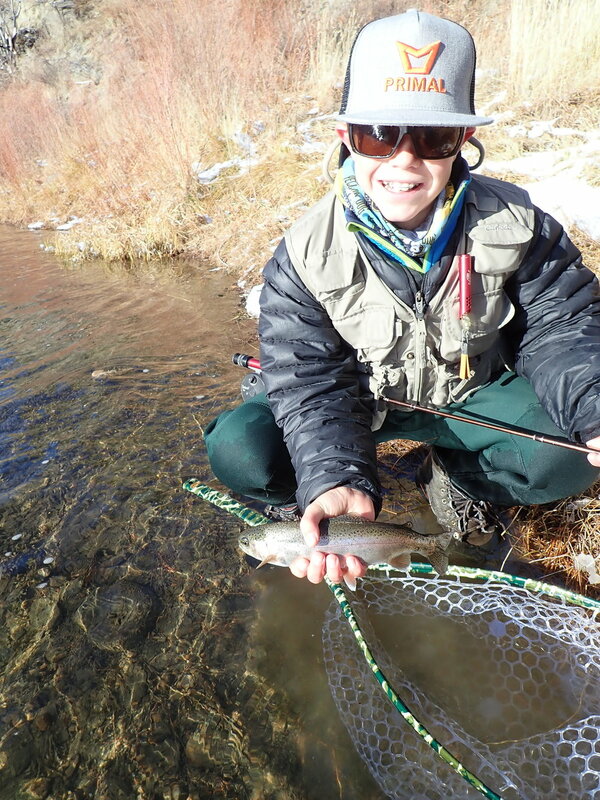 A green drake emerger landed me my first wonderful ranch rainbow and I created another memory. What a place! Its so fishy - put it on your bucket list to go. Life is made of stories and at least one waits for you on the banks of the Henry's Fork. What makes a great fisherman's lunch? I know in NZ I’m more than partial to pies and coffee. One good friend and I managed 13 pies from a single bakery over a weekend. Needless to say we’d had our fill but his reconnasaince of the number one award winnning pie shop and flavours was too much effort to pass up! We sampled many of the flavours but once again the humble steak and cheese is hard to beat… although the lamb curry was pretty delicious! When guiding in NZ I’ve normally made sandwiches (vogels bread of course!) and with fresh fruit and a few sweets or bars – these have been well received. I havn’t yet found a bread I really like stateside yet so wraps have been my mainstay so far. The thing I miss the most here in Montana is the humble meat pie. I’m sure there is an opening here and most folks I talk to, who have been to NZ, agree. Now I think I’d better get a recipe going and whip some up! If you have one for the pastry – please email me. I really notice we anglers probably don’t hydrate enough while on the water. When I consider high performance in sport – hydration is critical. Enuring we maintain concentration requires us to keep up our liquids and usually for me my sugar levels – without them spiking. Slow release sugars work best and although I love my “gummy snakes” – I normally keep them for the walk home or an additional boost right at the end of the day. When I find the perfect lunch over here stateside – I’ll be sure to let you know. If you have any suggestions – I’m certainly open to that. Today I’m off to fish the Henrys Fork. A river I grew up reading about. Its going to be an adventure! This last weekend I was fortunate to have gone camping with my partner on a lake situated at 6500 feet. It is the home of grayling and cutthroat. Oh what fun! It was amazing to be able to catch these beautiful fish, with their stunning dorsals and amazing colours. The Arctic Grayling is a species native to northern North America. The only populations native to the lower 48 states were in Michigan and Montana, and the Michigan population is now extinct. Consequently, the fluvial or river-dwelling population in the upper Big Hole River are the last remnants of this native Fish of Special Concern. Originally, the fluvial Arctic Grayling was widespread throughout the upper Missouri river drainage as far downstream as Great Falls. Lewis and Clark made note of these "new kind of white or silvery trout" in 1805. The lake-dwelling form is fairly common in 30 or more lakes across the western half of the state. These lake fish are genetically, but not visibly, different from our native fluvial Arctic Grayling. Grayling are easily out-competed by other salmonid species. This probably explains much of their demise from their native range. They are spring spawners and broadcast their eggs over a gravel bottom in moving streams. Grayling can overpopulate, producing severely stunted populations in some mountain lakes. Grayling are truly a unique Montana species. The iridescent hues of a spawning grayling's dorsal fin are brilliant. Exceptional individuals can weigh up to 3 pounds and reach 20 inches in length. They are generalists, eating a variety of aquatic invertebrates (Montana Fish, Wildlife, and Parks). The fish I caught were certainly old and perhaps stunted. there were literally hundreds if not thousands present and it was a fish a cast. I remember the very first grayling I caught. It was in the Big hole river. I'm very motivated to find more and will be looking in the Hyalite system and other small lakes for their presence. I love that about Montana! The variety of species and fishing opportunities are mindboggling. to know many are native is also very cool. Golden trout are definitely on my to do list and I'm looking forward to the hiking which will take me to these beautiful waterways. Throughout life we are faced with a myriad of choices. Every moment is a chance to change and provide a better experience for ourselves and others. I've recently had the opportunity to volunteer for an organisation which supports post 9/11 veterans though flyfishing here in Montana. The Warriors and Quiet Waters Foundation. I am extremely grateful that I have been able to participate and it was incredible to spend some time with the vets and other volunteers. Flyfishing and the places it takes us can truly reward us with experiences and friendships which stay with us a lifetime. Moving to Bozeman, as a trout angler, wasn't a difficult choice. There are an incredible number of streams, rivers and still waters within a short drive and the fishing is nothing short of world class. Each day the opportunity to head to water - you are faced with many many choices. Not only location but the method you might choose to fish as well. Where were the other anglers? We saw boats at put ins and some folks plying the rivers with nymphs. Although they were in blue ribbon water - the water was high and coloured. We talked at length about the choices anglers make and what was the mindset to stick with a particular method or location when there were better options available. I've done it myself. Stuck with large dries when I knew a streamer would work better. Refused to fish particular places because of my preconceived ideas of the experience...Was it a stubbornness? Pride? Or is it OK to choose because thats how we wish it to be...even though better may outcomes occur through different choices? Funny how a 2 hour long drive home can raise such philosophical discussions. Flyfishing is like that.. you are so present when you are casting and fishing that when you re-enter the world, we always seem ready to solve its problems. Using an X Caddis in 12 and 14 was the trick and when faced with fish that had obvioulsy seen anglers all day I switched out to an emerger (Iris Caddis) or a deep sparkle pupa. I spoke with a number of anglers on the water and all had some success. It did vary though between parties. Some of course doing better than others. My own approach is to walk along the bank and to look for risers. I tend to fish a longer leader than I saw bankside (About 14 foot) tapered to a 5X leader. My rod of choice is my sweetgrass 8ft 4wt (Bamboo) and I always try to wade quietly within 20 feet of the fish before casting. The edge of the Madison has multiple currents and getting close helps to get a good drift, taking out difficult currents. I believe a softer rod capable of casting short distances helps as does the longer leader. I don't lead the fish too far and try not to "flock shoot" if I find a pod. One of the challenges is to see your fly amongst all the naturals. Lifting purposefully and not ripping line off the water keeps spooking fish to a minimum on false strikes. I used a small bright fly as a sighter a couple of times and do use the loon float putty too. It really helps to focus your eye on your fly. The cool thing about the Mothers day caddis hatch is that the flies are quite large (14) ..I used a 12 to good effect to stand out sometimes.. and the hatch occurs from early afternoon through to dark. Although the river was quite busy with anglers there were fish aplenty and bugs too! I hope you get a chance to experience this hatch. It really was fun and some good size fish came out to feast on the caddis. 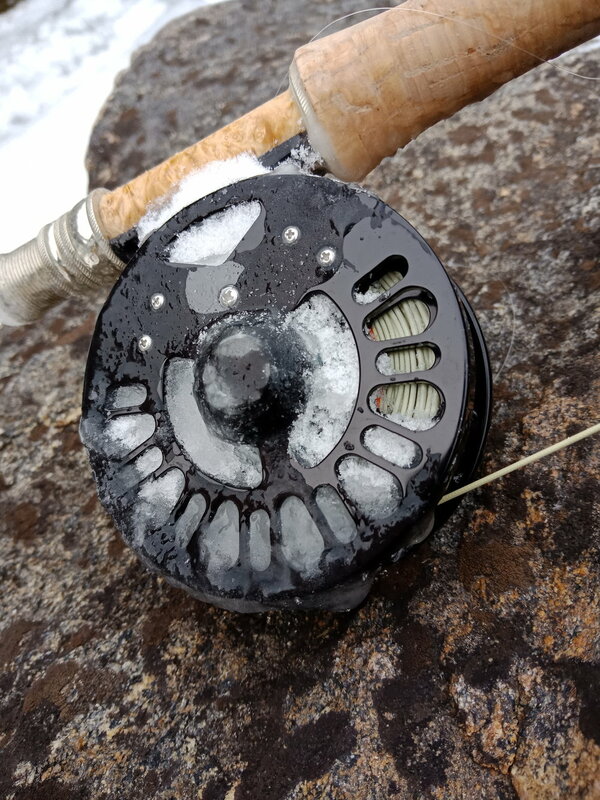 Recent warmer weather has started the snow melt here in Montana and the regular fishing season in Southland will have just drawn to a close. 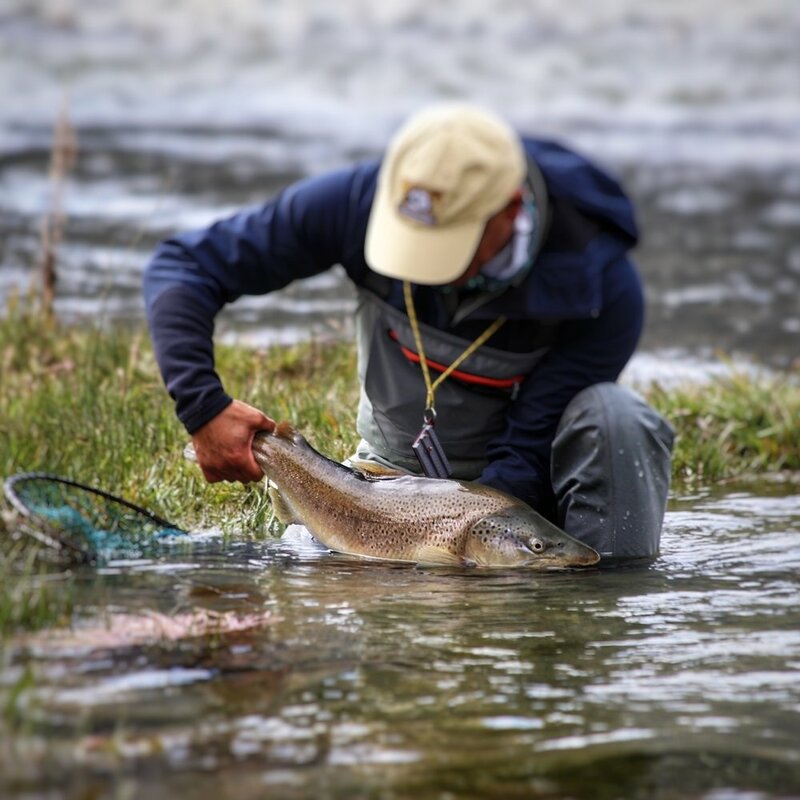 Whereas in NZ - anglers may be shifting to thoughts of running rainbows, Central South Island trout monsters and flytying - the season here in Bozeman is about to heat up. Last week the BWOs came off and this week with the warmer water and air temps - I expect the Mother's day caddis hatch will kick off. The water levels have risen though, as the snowpack has started to melt and water clarity has decreased markedly. These "run off conditions last several weeks and I am looking forward to finding alternatives and working out how to best take advantage of these "dirty" conditions. In NZ I would be heading to a couple of spring creeks, lake edges and tailwater fisheries when river conditions dictate alternatives because of dirty water. It will be the same here. Waters like the Missouri, Big Horn and other tailwaters will be fishable and there are a multitude of lakes to explore. Unfortunately access, although fantastic, is not quite as good to get onto spring creeks - as they are often held privately and a rod fee may be required. I've been fortunate to have fished a couple of the local spring creeks in the Paradise Valley, MT, and they are world class. De Puys, Nelsons Armstrongs are some of the better known streams and they will have some great hatches on them presently and of course crystal clear water. Last week I went to a local lake to fish with a friend and using a cool little variation on the wooly bugger caught some fun rainbows. Tales of massive carp and other species during the drive there got me pumped for the coming summer and I think I will have to dust off the 6 weight to be prepared for some new species action! Stay tuned!! I'm off later this afternoon to seek out risers. Fishing carefully - right on the edge of the Madison should yield me a fish or two. The fish will be seeking the quieter edges and holes to stay out of the rising water but still feeding in gentler current lanes. I'll fish a fly with some color with a small dropper if I have to nymph while waiting for the hatch. The weather is overcast and heavy... So I am very hopeful of surface action. The BWO hatch on the lower river last week was something I was looking forward to. I have been in Montana a few months now and as spring arrives with warmer temps, I’ve had some fantastic dry fly midge fishing and now mayflies. Friends have had great Skwala fishing on the Bitterroot and I had a lovely rainbow eat one yesterday on the Gallatin! Fishing the hatches in the US is something I had read about and now I am experiencing it first hand! My previous experiences with hatching mayflies have mainly been in the Mataura river, Southland NZ or on the Tongariro river Central North Island. The larger mayflies in the North Island were the Colobriscus – imitated nicely by the “Khakahi queen” size 12 and 14 and those in the south were Delatedium – nicely matched by the “Dad’s favourite” 16 and 18s (one of the more endearing names for a fly!) Now in Montana I am busy reading hatch charts and learning new flies, patterns and waterways. In contrast to NZ we would look forward to bright sunny days to take advantage of the predominately sight fishing opportunities . Low light and overhead cloud were great for hatches on the Mataura in April but then fish spotting became more challenging. Compare this to the conditions I have learnt to favour in my local rivers around Bozeman. Overhead cloudy days, perhaps with rain or even snow, early in the season, support the heaviest hatches. As a lot of the fishing is blind or to risers 45 North, I have found the ability to read water and find prime feeding lies a real asset. Fish numbers are much greater than I have experienced in NZ (The Madison, boast counts in the thousands of fish per kilometre! ) but they are not dispersed everywhere. The fish may pod up for security when feeding and also the hatch itself may be very localised. Knowing where to look for feed lanes and finding fish is a skill. Particularly on the “100 mile riffle” - the Madison. This week I fished the lower Madison. The wind was light where I was and the pewter sky was everything I had read was conducive to encouraging a good hatch. As Light snow fell throughout the day I experienced an incredible hatch of small BWOs. In fact I “left them rising” feeling replete as I had had more than several hours of wonderful dry fly fishing. Wading quietly I would approach each rising fish to within 20-30 feet. Keeping casts short and my leader long (12-15ft) I could present my fly accurately. I may have had to present multiple times if necessary so the fish could see my fly amongst the dozens of naturals that were floating overhead at any one time. Several times I “upsized”my pattern just to stand out from the crowd! Using this strategy I coaxed a good number to my dries and was pleased with the confident way in which the fish took my freshly tied imitations. In contrast to NZ the flies I used were generally smaller to match the hatching mayflies. I used a range of imitations from parachutes and sparkle duns to cdc emergers - varying things up depending on the surface water conditions and my ability to see my fly amongst all the tiny sailboats coming downstream. I was using 16s and 18s as opposed to my default 14 on the Mataura. Upon comparing my flies and the naturals, even a 20 might have been a better size match but those hooks seem to small for me just yet! I rarely use full hackled traditonal patterns anymore although have fun tying them. Fishing flies that can double as emergers or duns works best for me. 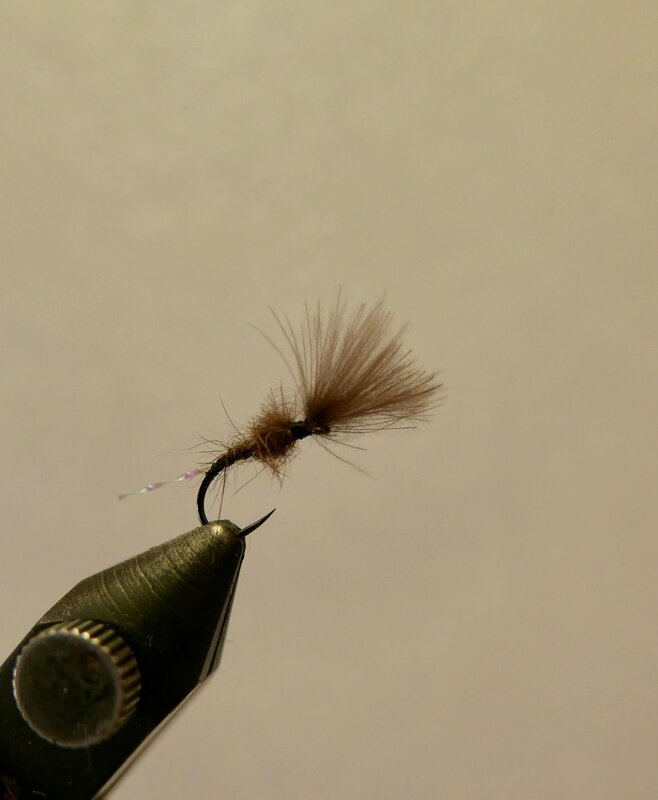 The quigley cripple style and sparkle duns work very well. Ive attached a few photos below and am tying in preparation for the next good overcast day. I’m also beginning to research the next major hatch we will see on the local rivers here. The Mothers day caddis! When I meet folks here or friends contact me from NZ, invariably the question arises ... Whats different about the fishing? I think I'll actually start off with whats the same?..Because there are many similarities between locations and these amount to amazing experiences. Spectacular scenery, friendly locals, lots of variety (rivers, streams, stillwaters, tailwaters spring creeks...), incredible access, fun fishing! Differences? Well... the many different types of trout and other species which are available to the angler here 45 North is very cool. I am excited to head into the hills near Bozeman later this summer to chase Golden trout and I get a massive buzz watching the voracious way cut-throats attack a big dry. As with the fish, the wildlife on stream is nothing short of being in National Geographic! Deer, eagles, massive sandhill crane, beavers, skunks, moose and of course bears! I must admit to being a little naive with the large mammals as in NZ there are none (except for deer but they are extremely shy and to see one bankside would be very rare) Just last week when Sue and I went for a quick fish on the Madison - I nearly walked into a young moose bull. I believe we both got a fright about the same time and gratefully he moved away from us. What amazing creatures but not to be trifled with! The stories I've already been told about mother moose and their calves will keep me more vigilant as I wander around the forests. There are no snakes in New Zealand and now that spring is here and many of the migratory birds are returning North, I realise in NZ we have constant birdsong. The large raptors - eagles, osprey.. and other fish hunters, keep the super shallow water (45 North) free from large feeding browns although the trout will move to the edges to feed on the huge salmon flies and the terrestrials as the weather warms. In New Zealand we would generally be stalking fish. This is perhaps one of the primary reasons folks travel from near and far to fish. To sight a big brown right on the edge, throw a bushy dry, have him lift slowly to inhale your fly and then blast all over the pool in a full rage! The fish are sometimes so shallow their fins might be out of the water. Having a great guide or fishing partner with a great pair of "fish spotting eyes" makes all the difference! Moving to Bozeman and enjoying the new is so much fun. I've met so many incredible people, they have welcomed me to my new home and taken me to some amazing places and water. I havn't been able to walk past any of the cool flyshops which are everywhere here in MT and they are like Aladdin's cave for fly junkies! A wee Brown with a BIG appetite! 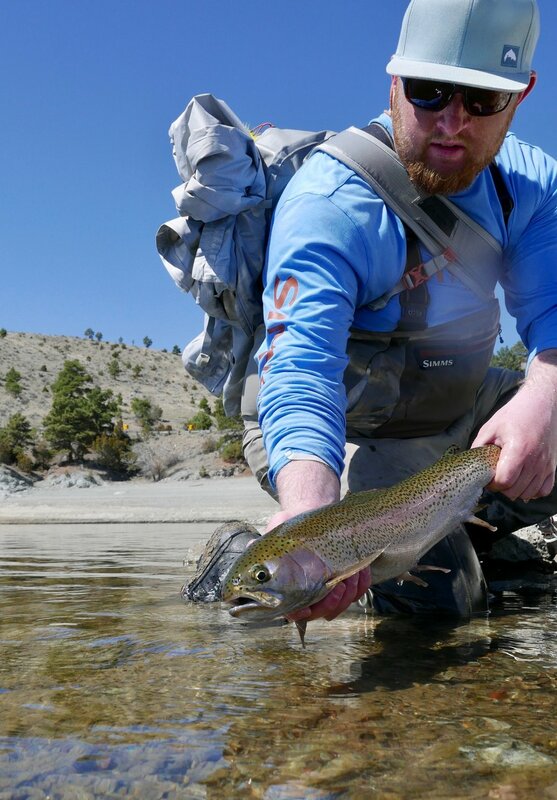 A Skwala eating rainbow on the Gallatin! Welcome to my first blog from the latitude 45 North! I will be looking to writing weekly on a variety of topics and keeping readers abreast of fishing adventures. I hope you’ll keep returning to check it out! As a new resident to Montana, from New Zealand I’m excited to share experiences and observations as the journey unfolds. Just like in NZ, folks in Montana are super friendly and I have already met so many wonderful people – I’m feeling right at home! Off snowboarding later today!! …this place is truly an outdoor paradise! After spending several months of summer in NZ and a week in Costa Rica (Ola!) I am settling into Bozeman life. I’ve managed to spend some time streamside on DePuys spring creek, the Gallatin (which is only walking distance from my house!) and the Madison. I’ve fished tiny midges to huge stonefly patterns and learnt so much already. Later this week I’ll be heading North and floating another river to throw streamers at good size browns. Should be fun!! Can’t wait to get the pics and share some of my observations with you. Presently the weather is typically spring fickle with warm days and then snow storms. Of course theres no such thing as bad weather just bad gear and as you will see from the pictures from yesterday – we were warm in our waders and jackets …smiling in the super cool snow storm! The snow pack looks good for a great summer of fishing here and I can’t wait until some of my NZ mates arrive, in July, so we can fish some of the local hatches and throw dries at rising fish. Its autumn (Fall) in NZ. I know this month my friends in NZ (45 South) will be busy tying small mayflies for the delatedium hatch on the Mataura. My favourite pattern is the simple CDC emerger pictured below. Periodically I will cover off happenings in NZ and write about recent adventures and ramblings “downunder”. I had a fun season in Southland for the months I was there and at times, the fishing was off the planet good with cold water and low flows. Early season was incredible and even when the rains came great fishing was had by those who knew where to look. I’ve finally started “that book” we all have in us and I know a small taster will appear in a flyfishing magazine shortly. I hope you enjoy it when it is published and I’ll let you know when the magazine hits the stands. I’ve just read Bob Wyatt’s article online (flylife.com.au) and echo his sentiments wholeheartedly. It’s a great piece. Approach and mindset to advance our fishing skill is the key to wonderful days streamside and successful angling. In the meantime, thanks for checking in and I hope you will feel free to write to me, do keep reading my blog. I look forward to posting and taking onboard your comments.